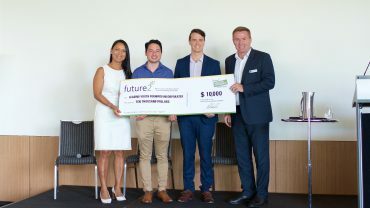 The WA Chapter recently presented a $10,000 grant cheque to Leading Youth Forward, who give at risk teens positive experiences by carefully matching them with mentors. These mentors provide one-on-one support to help these teens build confidence through partaking in challenging activities that help nurture relationships through teamwork. Leading Youth Forward is entirely volunteer-run. The cheque was presented by WA Chapter Chair, Fran Hughes CFP®, Zacary Leeson CFP®, and Michael Carmody CFP®.